UNIONS ARE stepping up their campaign to have the Australian Building and Construction Commission scrapped, with strike-day rallies around the country on April 28. This comes after the federal government’s review of the ABCC recommended its draconian powers be kept in place for at least another five years. 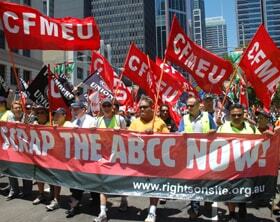 The ABCC is to be merged into the Rudd government’s new Fair Work Australia body. But it will maintain its powers to police union activity and harass building workers. This means there will continue to be a set of special laws that apply only to construction workers. They can be forced to answer questions under threat of six months’ jail, do not have the freedom to choose their own lawyer and cannot discuss what happens in an interrogation afterwards. Justice Wilcox, who carried out the government’s review of the ABCC, justified keeping its special powers because of “lawlessness” in the building industry. What he really means is that it is unacceptable that there are strong unions able to defend workers’ rights. The union rallies on April 28 will be held on the International Day of Mourning for Injured and Killed workers, to note how safety standards have declined since the introduction of the ABCC. Last year the ABCC was humiliated by the brave stand taken by Victorian construction union official Noel Washington. A public campaign and the threat of nation-wide industrial action kept him out of jail after he defied the commission and refused to appear at one of its interrogations. A combined mass meeting of construction unions in Victoria in early April passed a motion calling on all workers and union officials to refuse to co-operate with the ABCC, and pledged to defend anyone prepared to take the same stand as Noel and defy the commission. A string of cases like Noel’s where the ABCC is forced to back down due to the pressure of ongoing industrial action would make the commission powerless. Unionists need to look to build such a campaign. The strategy of lobbying the Labor party and hoping for change from Rudd has failed to get the commission scrapped. Industrial action on April 28 can be the beginning of this campaign.